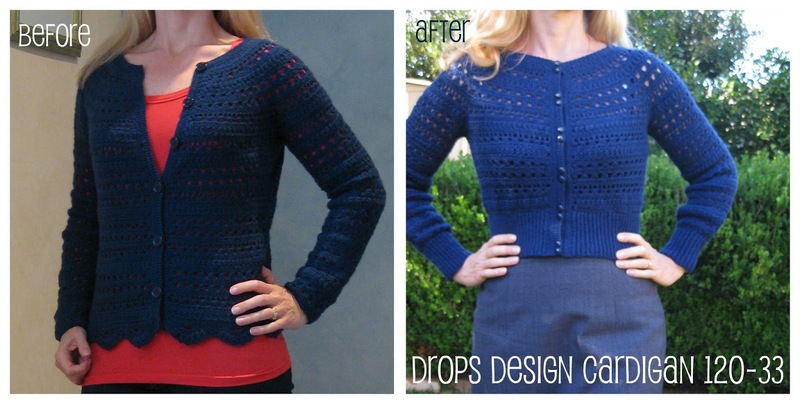 I recently remade my Drops Design 120-33 cardigan. I orginally made this last year and it immediately went into the “never wear” pile due to the sleeves being uncomfortably tight and also the style really wasn’t me. It also was rather large in the body and was bordering on “feeling frumpy” territory, another reason I never wore it. I really hate to spend so many hours on a project only to never wear it and so once some time had passed (to ease the pain) I decided to would rip back the parts that didn’t suit and redo . First up I frogged the sleeves and half the body until it was just above waist length. I then crocheted a ribbed waistband and cuffs. This is such a brilliant crochet stitch: just sc (single crochet, or double crochet if you are in the UK) back loop only. Thats it. The effect as you turn at each row end is a fantastic ribbed effect very much like knitted ribbing. 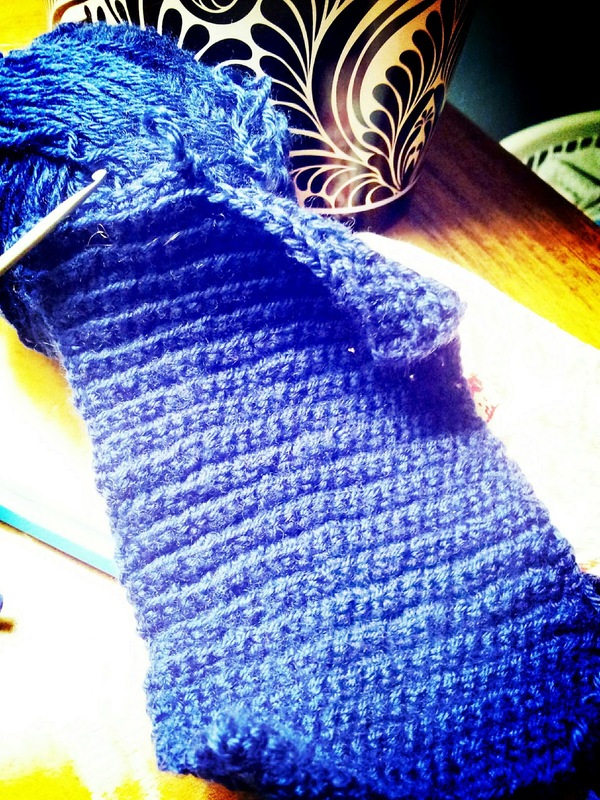 My ribbed band was 24 sc with a 2.00mm hook and 4 ply wool. 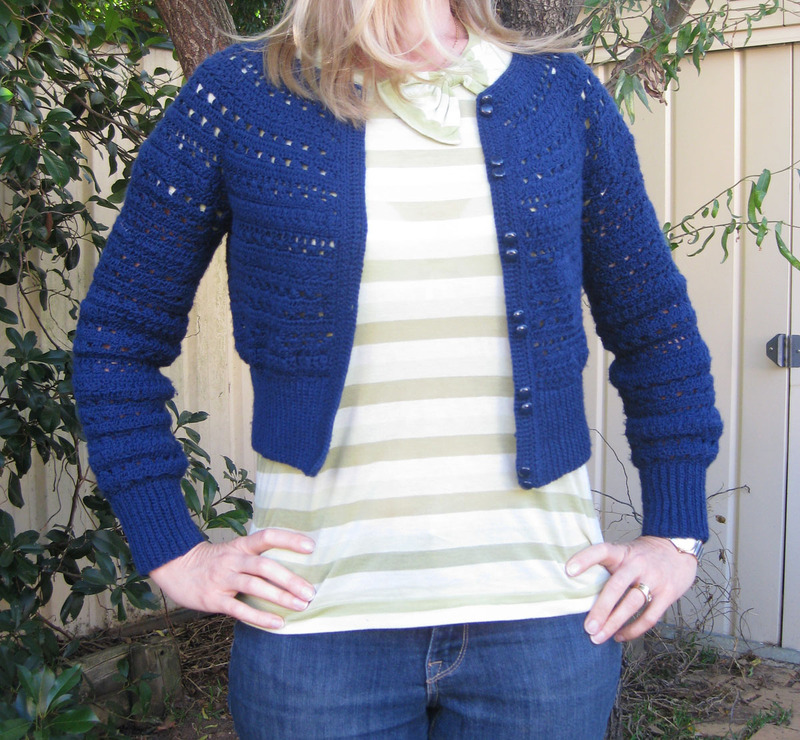 Once I got the waistband to the length I wanted I attached the the body of the cardigan with a simple slipstitch. I had to ease the cardigan in quite a bit as the waistband was a few inches smaller than the body. For the cuffs I joined into a cuff in the final row and then attached to the sleeve by doing another row of sc on the wrong side, carefully easing in as I went. When I redid the sleeves I increased 9 stitches on the first row of dc for a total of 71 dc (which was essentially doing a large size sleeve on the small sized body). The small sleeve was extremely tight but the medium was just right. I continued with the sleeves as per the pattern but did not do any decreases until the last few rows where I decreased 4 over 2 dc rows to bring the sleeve in a little for the cuffs. When I redid the front bands I did hdc instead of dc and on the last two rows I did sc, putting in double buttonholes as I went. I found in the first version they don’t have you do buttonholes, instead you just use the spaces left by the dc rows but I found that made it difficult to work out where to button up with plus the holes were so big I didn’t like the large buttons I needed. I am really happy with the double buttonhole and the little buttons on the revisted version. Overall, this was alot of work as I essentially completely remade more than half the cardigan (plus the sc rows on the ribbing seemed to take forever) but it is now something I absolutely love, its comfortable and I like it both dressy and also casually dressed down with a t-shirt and jeans. I’m so happy with this I am going to do another version (using a different stitch pattern but same concept) using a bright coral pink wool (Lotus) from Bendigo Woollen Mills, once again in the 4 ply baby wool (its so soft like expensive italian wool but Australian made and a fraction of the cost due to buying direct from the Mill).